A restaurant named after Donald Trump is building a loyal following in the middle of Russia. The restaurant has been growing in popularity in Siberia, its manager said on Wednesday. He spoke at a time of increased Russian interest in the U.S. president after his meetings this week with Vladimir Putin. Trump Burger opened in the city of Krasnoyarsk last December. The restaurant is now trying to use all the talk about the U.S. leader to expand its business. Trump spoke of wanting to improve ties between the countries during his talks on Monday in Helsinki with President Putin. The walls of the eatery are covered with paintings of the U.S. president. The food it offers includes such choices as a Trump Burger with bacon and a Melania chicken burger, named after Melania Trump, the president's wife. Demand is really not bad for a restaurant that opened just recently, manager Igor Vinogradov told the Reuters News Agency. He noted that some customers drink too much alcohol and have no great liking for the United States. They sometimes are critical of the restaurant's theme and have demonstrated rowdy behavior, he added. There were celebrations in Russia after Trump won the U.S. presidential election in 2016. As a candidate, Trump had called for improved relations with Russia and praised Putin. At Monday's summit meeting, Trump shocked the world by questioning the findings of U.S. intelligence agencies that Russia had interfered in the 2016 elections. Trump also praised Putin's "strong and powerful" claim that Russia was not involved in the vote. The Wau Holland Foundation is named after Herwart Holland-Moritz, also known as Wau Holland. You’re most fertile in the middle of your cycle, approximately 14 days into a 28 day period. You must try to strike a happy medium. 5.Trump spoke of wanting to improve ties between the countries during his talks on Monday in Helsinki with President Putin. And the product I speak of is ourselves. 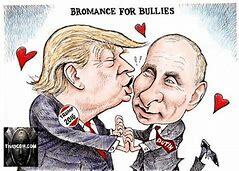 6.As a candidate, Trump had called for improved relations with Russia and praised Putin. Some turn on the meaning of federal law. The others call for interpreting the Constitution.